Stock# 41665. Includes dealer discount of $7,000. Dealer retains all manufacturer rebates and incentives. 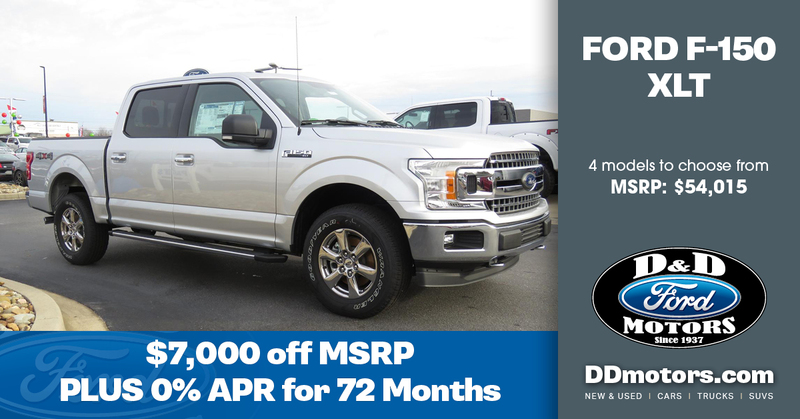 Discount includes XLT package discounts and D&D Trade Assist cash of $1,000. D&D Trade-Assist Cash applies to trade in for a 2010 or newer vehicle. RequiresFord Credit financing. Not all buyers will qualify for Ford Credit financing. 0% APR financing for 72 months at $13.89 per month per $1,000 financed regardless of down payment. Price includes $389 closing fee. Residency restrictions may apply. Price does not include SC Infrastructure Maintenance Fee, tags, title, or any other applicable taxes and fees. Offer expires 4/1/19.